Denker’s rotary planing and cutting head fits any rotary tool that will hold its ¼” shank, whether it be a router, a rotary tool, a spiral cutter, or tool with a flex shaft. Made in the USA and hardened to 62 RHC, Denker claims the cutter can slice through tough hardwoods even if it’s green or has burls. They design the head to cut one chip every revolution, and it rides the surface of the wood to help guide the cut. It will cut a little or a lot of material depending on how you hold it against the wood. 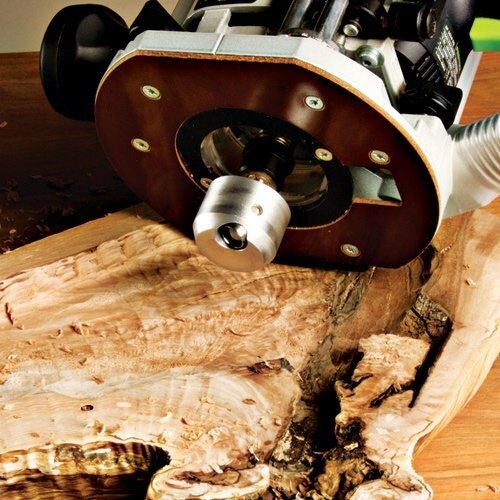 Even though Denker claims “This is THE safest, most versatile, efficient ¼” shank power carving tool available,” I find something scary about chucking this cutter into a full-sized router like they show in the picture. A router has a large 1 to 3hp motor with a lot of momentum behind it. Besides being heavy, it will torque your arms when you tilt it, making it much harder to control. It’s hard enough to control a router freehand while resting on a flat surface. My concerns aside, you can pick up this planing and cutting head for $50. 7 Responses to Carve With Your Router? This has got to kick like a horse, anyone tried one? Wow, same piece of wood as the previously shown “Hand Shave.” I guess that gnarly guy’s a star now! Good catch. I’m guessing the photos were done by Eagle America’s marketing department rather than on the shop floor. It makes you wonder what tool they actually used to carve out that piece of wood. Like the price but the idea scares the h__l! out of me- lots of momentum at hyper-speed. I have the 1/4″ version that is shown in the router and the 5/8″ version for my angle grinder. The 1/4″ version works well in small routers. I use mine in a Bosch Colt VS laminate trimmer. It also works well in a die grinder, you just have to be able to regulate your speed depending on the material you are cutting. The 5/8″ version replaced my “chain saw” discs. I used those for years and always got kick backs. Never like them! This tool takes out just as much material and I much better control of the cutting action. I didn’t believe these cutters would do everything they claim to but I was impressed!